In collaboration with Paul Friedman, of Rock the Bike, I am documenting my build of a green power speaker system. The system consists of multiple components. 1. It all begins with the bike. The pedaling of a typical 26" mountain bike will be initiate the system. This circular motion produced by the user will provide the system with the potential energy. 2. At the bottom of the wheel, we are using a bike stand and resistance wheel. 3. As the bike spins, it will rotate the resistance wheel. Attached to the resistance wheel is the generator. I am using a 12v DC scooter motor. 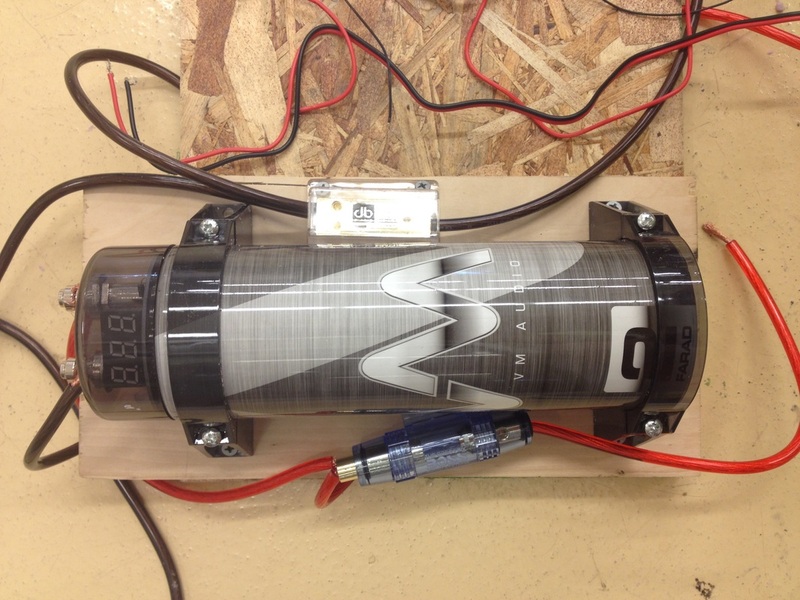 When the motor is spun, it generates voltage. 4. Due to the inconsistencies of pedaling, the generator will produce a wide range of power. In order to utilize this electricity, it must be smoothed out. The 2 Farad Super Capacitor does this job. In essence, the capacitor is a battery that has the ability to charge and discharge very quickly. The generator here will charge the capacitor which will serve to store the energy and smooth out the voltage. 5. The Capacitor will then feed to a small Audio Amplifier. Here, the user will be able to control the volume and plug in their own music. The Amplifier powers the two book shelf speakers where music will come out. Here is the mountain bike that we are going to use. The bike has multiple gears which will allow users to determine how hard they need to pedal. I chose to use a bike with gears instead of a simple stationary bike for this reason. I knew that there would be a wide range of users, so I made the bike to be dynamic. With a wheel diameter of 1/4", I calculated the radius to be 1/8"
However, we are in tangent with the resistance wheel which has a radius of 3/4"
The radius of the bike wheel is about 25". The ratio between the bike and generator would therefore be 1/2" : 25"
Therefore, in order to achieve a max generation at 3,456 rpm, one must pedal at 3456/33 or 69.2 rpm. I purchased a basic 2 Farad Audio Capacitor. The Farad is a unit of how much energy it can hold. Anything above 2 should be fine. Props to Mr. Anderson on this capacitor analogy. For those of you who do not know what a capacitor is, in effect, it is basically a battery that can charge and discharge very quickly. Lets begin by imagining a tube with a divider in the middle filled with water. At the bottom of the divider is a hole that always water to transfer between sides. At rest, the water is at equal levels. However, as you begin to add charge to one side, the difference increase. On one side, the water will be near the top, while on the other, it will be close to empty. At this point, the capacitor is fully charged and will no longer accept current. When the amplifier requires more charge, this potential energy stored in difference of water's height will shift back to neutral state. 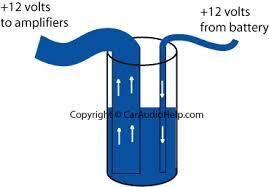 As the water moves back to equal, it feeds out some current to the amplifier.